Take a Bag, Leave a Bag! Now located at the Customer Service Desk. Forgot your reusable bag at home? Grab one from the Bag Exchange. 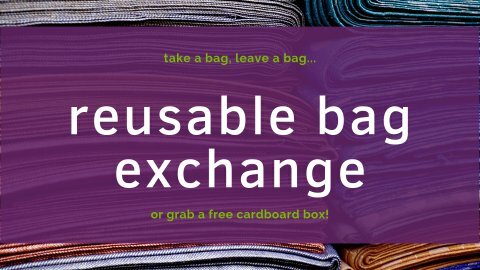 Got a stash of extra cloth bags you don’t use? Bring them in to find a new home. Underneath the bags you will also find empty cardboard boxes recycled from the Freight department. While paper shopping bags are a far better option than plastic, we believe in reducing one-time-use materials as much as we can. Even paper production and recycling cause environmental burdens when you consider deforestation and the energy used up in production, transportation and recycling processes. Plus, disposable materials cost the Co-op funds that could be better used elsewhere - like lower prices and better services for you!